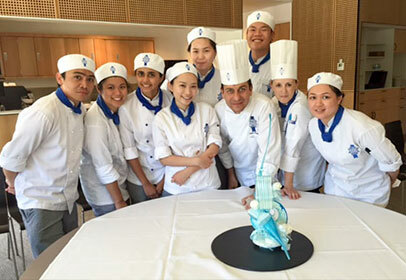 Over four days recently, Le Cordon Bleu’s Melbourne campus was fortunate to host Chef Fabrice Danniel. Chef Fabrice is one of the world’s most acclaimed Pastry Chefs and Assistant Culinary Arts Director, Head of Le Cordon Bleu Pastry Department. Chef Fabrice gave a Master Class to a full house of Le Cordon Bleu students and staff, preparing his ‘Le Voyageur’ (The Traveller) mouth-watering creation. He was assisted by Melbourne’s own Chef de Pâtisserie, Karin Rechsteiner. Chef Fabrice also participated in a number of scheduled classes in both Cuisine and Pâtisserie, offering his great technical expertise across both culinary fields. Leaving Melbourne, and in keeping with his international role, Chef Fabrice headed first to Le Cordon Bleu, Wellington and then to our recently opened campus in Shanghai before returning to Paris.